CD3 is a member of the immunoglobulin superfamily and acts as a mediator of signal transduction. It is a multimeric protein composed of four distinct polypeptide chains (ε, γ, δ, ζ). Each of these chains contain immunoreceptor tyrosine activation motifs (ITAMS) which are required for initiation of signaling cascades, as they recruit protein tyrosine kinases, signaling intermediates and adapter molecules. CD3 is expressed by a high-percentage of circulating peripheral T cells forming a complex with the T cell receptor (TCR). 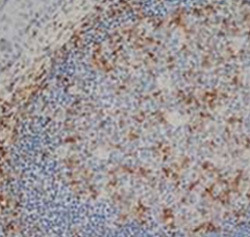 As CD3 is present at all stages of T cell development, it is a highly effective T cell marker. Read our CD3 mini-review for detailed information on CD3 including its structure alongside that of the TCR, the genes involved in its expression, its function and the signal transduction pathways mediated by the CD3 complex. Here we look at anti-CD3 clones and their recommended applications. CD3 antibodies are also available for dog, pig, chicken and Rhesus monkey. Fig. 1. 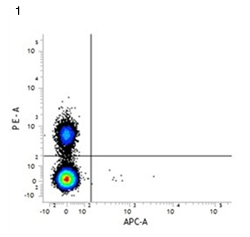 RPE conjugated rat anti-mouse CD4 (MCA4635PE) and APC conjugated rat IgG2a isotype control. Fig. 2. 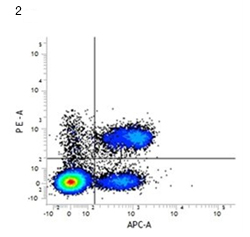 RPE conjugated rat anti-mouse CD4 (MCA4635PE) and APC conjugated rat anti-mouse CD3 (MCA500APC). All experiments performed on murine splenocytes in the presence of murine SeroBlock (BUF041A). Fig 3. Staining of a formalin fixed paraffin embedded human tonsil with rat anti-human CD3 antibody, clone CD3-12 (MCA1477) following heat mediated antigen retrieval. Arnett KL et al. (2004). Crystal structure of a human CD3-epsilon/delta dimer in complex with a UCHT1 single-chain antibody fragment. Proc Natl Acad Sci U S A 101, 16268-16273. Dave VP et al. (1998). Altered functional responsiveness of thymocyte subsets from CD3delta-deficient mice to TCR-CD3 engagement. Int Immunol 10, 1481-1490. Nicolls MR et al. (1993). Induction of long-term specific tolerance to allografts in rats by therapy with an anti-CD3-like monoclonal antibody. Transplantation 55, 459-468. Vossen AC et al. (1995). Fc receptor binding of anti-CD3 monoclonal antibodies is not essential for immunosuppression, but triggers cytokine-related side effects. Eur J Immunol 25, 1492-1496.